Atlanta’s longest-running “Big Game” Weekend event! Welcome to the official page to get all the information about the Three Piece Suit Football Charity Festival, which happens annually every Super Bowl Saturday in Atlanta! This year’s Festival features the 11th installment of the football game — TPSF XI — featuring men & women playing full-contact tackle football while wearing three-piece suits! The free-admission charity festival will feature food trucks, cocktails from Tito’s Vodka, local beer from Atlanta Brewing Company, face painting for kids, live music from The Murphs and Wasted Potential Brass Band, and a Frisbee dog halftime show! Of course, the centerpiece of the fun-for-all-ages festival is a picture-worthy game of tackle football being played by men and women in classy, colorful, and often flamboyant three-piece suits! This spectator-friendly event makes for a great afternoon in the park! Support for our charities, Pets For Vets and Battlefields To Ballfields, is raised during the festival through alcoholic beverage sales, donations, and the “Big Game Tickets Raffle” to cap it all off! So bring your friends and family out, stop by the food trucks & beer tents, and enjoy an afternoon of hard-hitting tailored football to support two worthy causes! ➤ Charity 2019 & Big Game Tickets Raffle! For the answer to this — plus all the event details — click HERE for FAQs. The TPSF Charity Festival is a unique and exciting platform to raise awareness and monetary contributions for Veteran charities. This year we are supporting two great Veteran causes! We will once again be playing to support Pets For Vets GA, a local Georgia charity. Also, we will be supporting Battlefields to Ballfields (B2B), a charity founded by NFL on Fox rules analyst, Mike Pereira. B2B helps returning veterans train to become sports officials! Scroll down to see how to support our charities! For the fourth year in a row, Three Piece Suit Football is supporting Pets For Vets Georgia Chapter (PFV). As a registered 501c3 non-profit organization, Pets For Vets Georgia Chapter’s mission is to help rescue homeless/shelter dogs and train them to be service animals for Veterans in need! Pets For Vets Georgia Chapter works locally with Georgia Veterans to meet their needs and match them with a dog that will aid in helping the Veteran to cope with a variety of issues including posttraumatic stress disorder (PTSD), traumatic brain injury (TBI), and other mental and physical health-related challenges. Last year, TPSF raised over $18,000 for Pets for Vets GA Chapter! There are several ways to support this great cause at this year’s Three Piece Suit Football Game, so help us out-do ourselves this year! New this year, TPSF is also supporting Battlefields to Ballfields (B2B). Founded by Mike Pereira, former VP of Officiating for the NFL and current NFL on Fox rules analyst, B2B helps returning veterans train to become sports officials by providing scholarships to help train and pay for equipment. B2B is a national charity that recently began a chapter in Atlanta. 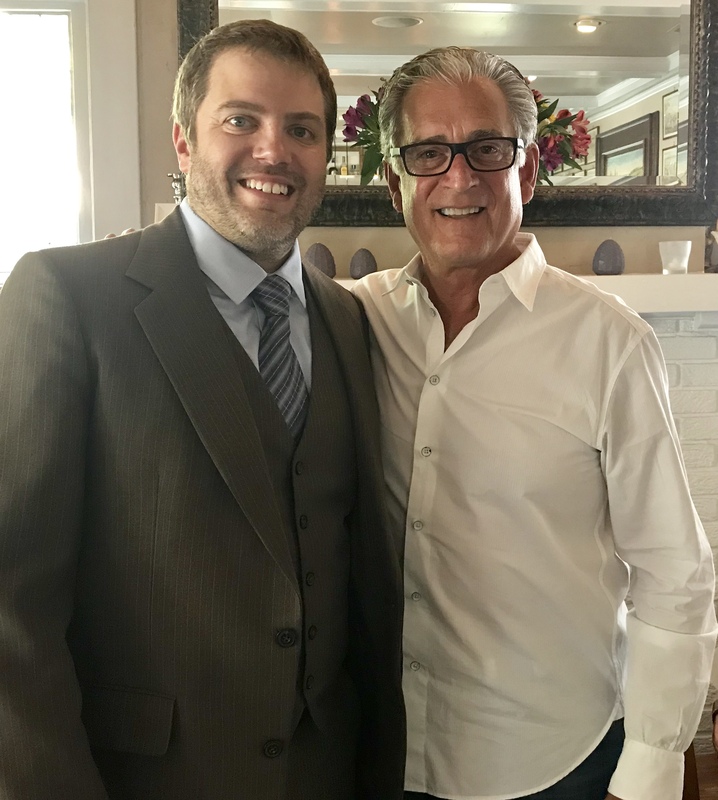 Additionally, to help support B2B, Mike Pereira will be at TPSF this year serving as the celebrity referee to call the game along with other officials! 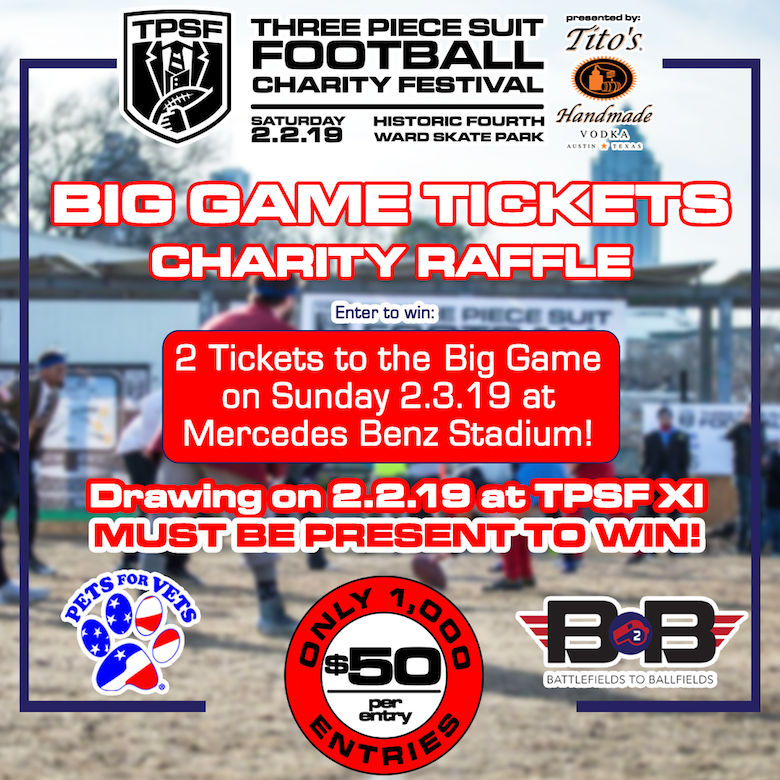 On Feb 2nd, TPSF will hold a Big Game Tickets Raffle, in which the winner will receive a pair of tickets to the Big Game the next day on Sunday February 3, 2019 at Mercedes Benz Stadium in Atlanta! Raffle entries are $50 each and only a maximum of 1,000 entries will be sold. The drawing will occur during TPSF at 4:30pm (approximately the end of the 3rd quarter of the game) and YOU MUST BE PRESENT TO WIN. All proceeds will go to support our charities, B2B and PFV! Click here to learn more and to enter the raffle! What exactly is Three Piece Suit Football? Three Piece Suit Football (TPSF) is an annual charity football game played every Super Bowl Saturday in Atlanta. This exciting game features men & women engaging in full-contact tackle football while wearing three-piece suits! TPSF originated in Atlanta in 2009 and started a Boston Chapter in 2014 (click here for full TPSF history). Our annual game has grown into a festival, and for the fourth year in a row will be held at the athletic field of the Historic Fourth Ward Skatepark, along Atlanta’s popular BeltLine urban trail! The charity festival will feature food trucks, cocktails from Tito’s Vodka, local beer from Atlanta Brewing Company, face painting for kids, live music from The Murphs and Wasted Potential Brass Band, and a Frisbee dog halftime show! Of course, the centerpiece of the fun-for-all-ages festival is a picture-worthy game of tackle football being played by men and women in classy, colorful, and often flamboyant three-piece suits! This spectator-friendly event makes for a great afternoon in the park! Support for Pets For Vets and Battlefields To Ballfields is raised during the festival through alcoholic beverage sales, donations, and the “Big Game Tickets Raffle” to cap it all off! Are Tickets required for entry to the event? No! This is a FREE ADMISSION event to watch the football game! However, you can purchase VIP Access to enhance your festival experience. VIP tickets are available which include several great perks! Advance sale VIP Access is only $40!! Limited number of VIP tickets available, so click the link above to purchase yours today! Where is the event located? Three Piece Suit Football will take place at the Historic Fourth Ward Skatepark athletic field, on the BeltLine. For more information on LOCATION/DIRECTIONS – CLICK HERE. Wait, so can I actually PLAY in the Football Game? Unfortunately, our player slots are currently full. To be eligible to play in a TPSF game, our players have contributed throughout the year to support our mission by participating in our other charity events and donating their time to support our causes. If you’d like to learn how to get involved for future events/games, please fill out our contact form and we’ll let you know how to get involved. So for now, just come out, relax, & enjoy the watching the dapper game! Do I have to wear a three-piece suit if I’m just coming to watch? We get that question a lot, and the answer is no. We love seeing our fans dressed to the nines, but it’s not a requirement at all! Wear whatever suits you best (see what we did there?) and allows you to have a great time. We’ll have plenty of TPSF merchandise available for purchase at the event, so be sure to stop by our merchandise tent to get a t-shirt, hoodie, beanie, or hat! How can I participate in supporting the charities? We are selling our Big Game Tickets charity raffle entries online leading up to the event, and in-person during the event. The drawing will occur during TPSF at 4:30pm (approximately the end of the 3rd quarter of the game) and you must be present to win. The winner will receive two tickets to the Big Game happening the very next day at Mercedes Benz Stadium! Stop by the Pets For Vets or Battlefields To Ballfields tents, learn a little more about the work they do, and make a donation directly to the organization. Proceeds from the purchase of alcoholic beverages at the event will go to support the charities. The Three Piece Suit Football charity festival is presented by Tito’s Handmade Vodka, so visit the Tito’s tent to try a delicious cocktail. Atlanta Brewing Company, Georgia’s first craft brewery, is our featured local beer. Enjoy their Homestand pilsner, Soul of the City pale ale, and Hartsfield IPA. There will also be beer from Lagunitas and a variety of wines. How do I enter the Big Game Ticket Raffle? Purchase a raffle entry here on our website and then come to the TPSF Festival on 2/2/19. You must be present to win the raffle! With that, we know it’s a busy weekend in Atlanta, so we are going to draw the raffle winner at 4:30pm during the festival (approximately the end of the 3rd quarter of the game). Are Families and Pets Permitted? All ages welcome. Pets are allowed but must remain on a leash at all times at the event. And please be sure to clean up after your pet! Yes, entry to the event is ADA accessible. Please be aware that the entire event site is on grass in a City park green space. Should I bring cash? Are there ATMs on site? TPSF merchandise sales can be made with cash or credit card. Some vendors may be cash only, however. Cash is always good to bring for easy donations to the charity, but yes – there will be ATMs on site. What’s available for fans at TPSF? What should/can I bring to the event? What am I not allowed to bring in? May I leave and come back? Feel free to come and go as you please! But you don’t want to miss all the action. And you especially don’t want to miss the drawing of the Big Game Ticket raffle winner at 4:30pm! What is Three Piece Suit Football? © Copyright Three Piece Suit Football 2019.